After a week of hiatus, I am finally back and running! The weather switches 360° degrees and Belgium finally got a taste of the burning sun. This is the best time to pull out my Minkpink outfit. Even though my exams are over, I had an somewhat busy week. But I am back and fully committed again to blogging! If there is one brand that instantly makes me think of the summer it would be Minkpink! Their summer lookbook is always so girly, frilly and making me long for those summer days. Since it is summer, I don’t need to go over the top with layering. Just a simple shirt and short will do! The short itself is a statement piece and I topped it off with a simple black bustier. Summer outfits do not need to be complicated. One statement piece is enough to draw positive attention! ohhh, these shorts are amazing!!!!! fantastic with the sneakers! 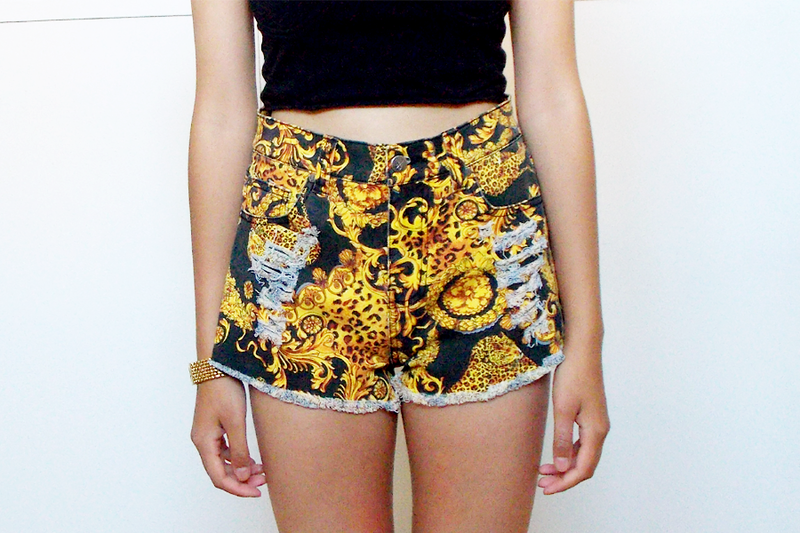 Beautiful shorts!! I love them! Love those shorts so cool! You look so stylish despite it’s so simple set 🙂 I love pattern on your shorts ! Fantastic shorts! They look fab for a festival! I LOVE CROPPED TOPS ❤ Super leuke outfit! I love those shorts. All I think is ‘ Versace, Versace, Versace, Versace, Versace, Versace’ as Drake says.. lol. They’re hot shorts!